Be sure to join in on the Wordless Wednesday Blog Hop hosted by my friend Deb of Focused on the Magic. Today's topic is Characters. 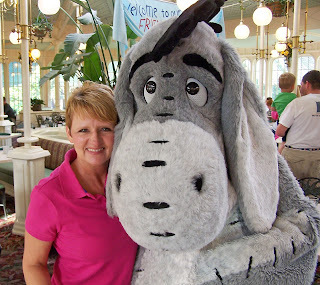 We love breakfast at Crystal Palace, and here I am with Eeyore. 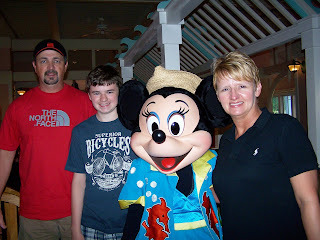 And of course, I had to have a picture of my Alter Ego, Minnie!! I love the photo of you and Eeyore! Thanks melissa!! It is one of my favorites from the trip! Great photos! By the way, we love Cape May's character breakfast!! It is one of our favorites! I love it! You look beautiful sans makeup!! Cape May and Crystal Palace are our favorites! I never would have know if you didn't tell. You look awesome and I love that Crystal Palace.. Thanks D!! I promise to blog more about my vacation very soon. Diane, we love Crystal Palace it's the only restaurant that we had ADR's for twice. Manda, you are very sweet! !